On my perpetual quest to find the rare and one-off, I gave myself a monumental challenge. Would it be possible to find one-of-a-kind attractions in the manufactured tourist metropolis of Cancun, Mexico and the soon-to-follow Riviera Maya? Turns out, yes. This tourism district that parallels the Caribbean coastline of the Yucatan Peninsula is much more than mega-resorts and partiers spilling, drinking and throwing tequila. 2. The longest underwater cave system in the world. When British cave diver Steve Bogaerts and cohort German Robbie Schmittner finally confirmed, after four years and 500 dives, that Sac Actun was, at 95 miles, the world’s longest underwater cave system, they dropped a bottle of Moet & Chandon champagne at the junction of Nohoch Nah Chich (Mayan for “Giant Birdcage”) and Sac Actun (White Cave), previously thought to be separate cave systems. The Quintana Roo Speleological Survey reports more than 435 miles of flooded caves in the Yucatan Peninsula including, to go with Big Daddy Sac Actun, the next four longest underwater cave systems, all accessed through clear cenotes (sinkholes) that Mayans considered sacred and depended on for water. Other discoveries in these impressive subterranean passageways include Mayan artifacts, 12,000-year-old human skeletons, stalactites and bones from mastodons, horses, giant tapirs and giant sloths. Not surprisingly, the 2005 horror flick, “The Cave,” although set in Romania, was filmed in the Riviera Maya. 3. A growth spurt worthy of Guinness. 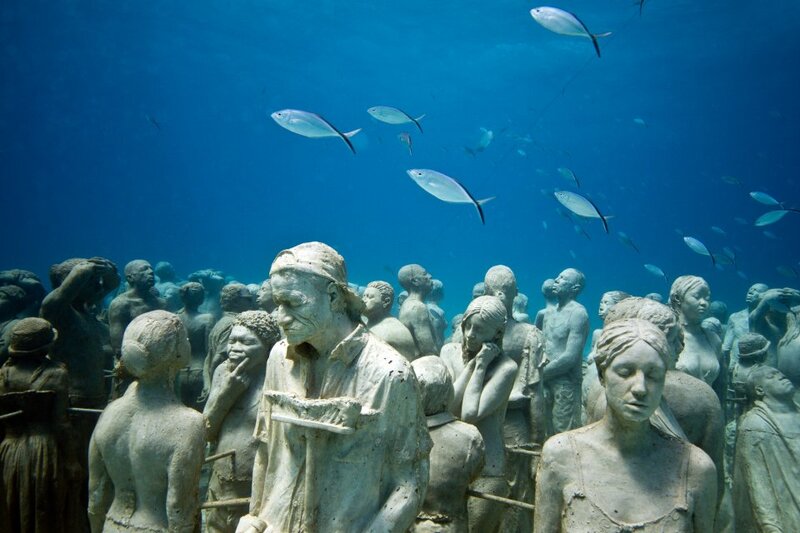 Choosing Cancun to host the 2010 United Nations Climate Change Conference was an ironic twist if ever there was one. If indeed humans cause global warming, this city of nearly 750 thousand residents could be its poster child. When the Mexican government began developing this potential tourist draw on the northeast coast of the Yucatan Peninsula, Cancun had a grand total of three residents, all of whom worked as caretakers for a coconut plantation. From that auspicious day of January 23, 1970, Cancun has grown into a mega-tourism playground drawing close to 5 million tourists a year who expend large amounts of carbon getting there to enter wet t-shirt contests, drink bathtub quality booze and play volleyball in resort swimming pools. 4. The ability to swim with 60-foot sharks without being in a cage. The average whale shark, weighing in at 20,000 pounds (think grey school bus with polka dots), has more than 300 rows of teeth. That fact alone would be enough to dissuade most people from getting anywhere near. But north of Isla Mujeres, an island off the coast of the Mexican Riviera where each summer the world’s largest concentration of these monsters congregate, people pay good money to get up close and personal with the world’s largest fish. There’s even a whale shark festival complete with a parade of school kids dressed like marine life. The good news is that whale sharks are mostly vegetarian–so those 3000 teeth (an average 10 vestigial specimens per row) are bypassed a unique filtering system that scoops up mass quantities of plankton, krill and clouds of spawning sperm. In other words, shark cages aren’t necessary. There are a few other places to swim with these benign, wondrous creatures (Atlanta’s Georgia Aquarium, for one, and off the coast of Captiva where 19-year-old Chris Kreis made headlines when he jumped aboard one’s back and rode for nine seconds), but nowhere else besides this seven-mile radius where the Gulf of Mexico joins the Caribbean Sea can you do the backstroke with a whole pod of between 20 and 50 school bus-size fish. 5. An eco hotel that cleans the ocean, generates renewable energy and is entirely self-sufficient. Okay, so Grand Cancun Eco Island isn’t operational yet. But by 2020, when Cancun celebrates its 50th anniversary, this offshore platform with a zero carbon footprint will be in full swing. Designed by award-winning architect Richard Motera Castillo, the Grand Cancun resort will be covered in solar panels, employ vertical wind turbines and will filter hydrocarbons and other pollutants. Where to stay: Sandos, a young company headquartered in Spain, lives and breathes sustainability. They’re busy remodeling all their properties, adding solar panels and since 2011, have reduced carbon emissions by 70 percent. There’s even an on-site windmill and an interactive program on Climate Change developed by NASA at the Caracol property. Look for three Sandos in Cancun and the Riviera Maya. subscribing to your feed and I hope you write once more soon!